Photo courtesy of Self-Realization Fellowship, Los Angeles. All rights reserved. 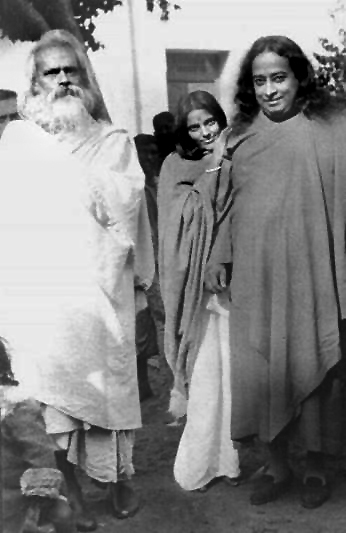 A great yogi, guru and founder of Self-Realization Fellowship/Yogoda Satsanga Society of India. He is from the order of Kriya Yog and author of some famous works as Autobiography of a Yogi, Second Coming of Christ: The Resurrection of the Christ Within You, God Talks With Arjuna — The Bhagavad Gita. A few days later I heard that the Blissful Mother was staying at the home of a disciple in the Bhowanipur section of Calcutta. Mr. Wright and I set out immediately from my father’s Calcutta home. As the Ford neared the Bhowanipur house, my companion and I observed an unusual street scene. Ananda Moyi Ma was standing in an open-topped automobile, blessing a throng of about one hundred disciples. She was evidently on the point of departure. Mr. Wright parked the Ford some distance away, and accompanied me on foot toward the quiet assemblage. The woman saint glanced in our direction; she alighted from her car and walked toward us. With these fervent words she put her arm around my neck and her head on my shoulder. Mr. Wright, to whom I had just remarked that I did not know the saint, was hugely enjoying this extraordinary demonstration of welcome. The eyes of the hundred chelas were also fixed with some surprise on the affectionate tableau. I had instantly seen that the saint was in a high state of samadhi. Oblivious to her outward garb as a woman, she knew herself as the changeless soul; from that plane she was joyously greeting another devotee of God. She led me by the hand into her automobile. but never before had I met such an exalted woman saint. Her gentle face was burnished with the ineffable joy that had given her the name of Blissful Mother.Long black tresses lay loosely behind her unveiled head. A red dot of sandalwood paste on her forehead symbolized the spiritual eye, ever open within her. Tiny face, tiny hands, tiny feet— a contrast to her spiritual magnitude! A short time later the Ranchi Vidyalaya was in gala array for the saint’s promised visit. The youngsters looked forward to any day of festivity—no lessons, hours of music, and a feast for the climax! “Victory! Ananda Moyi Ma, ki jai!” This reiterated chant from scores of enthusiastic little throats greeted the saint’s party as it entered the school gates. Showers of marigolds, tinkle of cymbals, lusty blowing of conch shells, and beat of the mridanga drum! The Blissful Mother wandered smilingly over the sunny Vidyalaya grounds, ever carrying within her heart the portable paradise. “It is beautiful here,” Ananda Moyi Ma said graciously as I led her into the main building. She seated herself with a childlike smile by my side. The closest of dear friends, she made one feel, yet an aura of remoteness was ever around her—the paradoxical isolation of Omnipresence. “Please tell me something of your life.” – “Father knows all about it; why repeat it?” She evidently felt that the factual history of one short incarnation was beneath notice. I laughed, gently repeating my request. “Father, there is little to tell.” She spread her graceful hands in a deprecatory gesture. “My consciousness has never associated itself with this temporary body. Before I came on this earth, Father, ‘I was the same’. As a little girl, ‘I was the same.’ I grew into womanhood, but still ‘I was the same.’ When the family in which I had been born made arrangements to have this body married, ‘I was the same.’ “And, Father, in front of you now, ‘I am the same.’ Ever afterward, though the dance of creation change around me in the hall of eternity, ‘I shall be the same. Ananda Moyi Ma sank into a deep meditative state. Her form was statue-still; she had fled to her ever-calling kingdom. The dark pools of her eyes appeared lifeless and glassy. This expression is often present when saints remove their consciousness from the physical body, which is then hardly more than a piece of soulless clay. We sat together for an hour in the ecstatic trance. She returned to this world. “Please, Ananda Moyi Ma,” I said, “come with me to the garden. Mr. Wright will take some pictures.” ‘‘Of course, Father. Your will is my will.” Her glorious eyes retained the unchanging divine lustre as she posed for many photographs. Time for the feast! Ananda Moyi Ma squatted on her blanket-seat, a disciple at liner elbow to feed her. Like an infant, the saint obediently swallowed the food after the chela had brought it to her lips. It was plain that the Blissful Mother did not recognize any difference between curries amid sweetmeats! As dusk approached, the saint left with her party amid a shower of rose petals, her hands raised in blessing on the little lads. Their faces shone with the affection she had effortlessly awakened. ‘”Thou shalt love the Lord thy God with all thy heart, and with all thy soul, and with all thy mind, and with all thy strength:’’ Christ has proclaimed, ‘‘this is the first commandment.” ( Gospel of Mark Ch12, v30). As she boarded the train, I marvelled to see that whether amidst a crowd, on a train, feasting, or sitting in silence, her eyes never looked away from God. * Ananda Moyi Ma does not refer to herself as “I”: she uses humble circumlocutions like this body” or “this little girl” or “your daughter.” Nor does she refer to anyone as her “disciple.” With impersonal wisdom she bestows equally on all persons the divine love of the Universal Mother. From Autobiography of a Yogi by Paramahansa Yogananda.